There is a tremendous urgency to reduce energy consumption to guarantee quality of life for future generations. In the light of the weak results of behavioral approaches and top-down investments on infrastructures for energy efficiency, such as grid management, smart meters and the like, innovative approaches to tackle this issue are required. This research presents a sociological approach and explores the extent to which social interactions, at the level of the neighborhood, might be able to challenge current energy needs and to spur the construction of new meanings of energy, which ultimately might lead to a reduction of energy usage. 1) The role that energy-related data and information (from ‘hard’ data such as in energy footprint calculators, statistics, etc. to ‘soft’ data such as personal experiences, stories, etc.) can play in moderating the aforementioned social interactions. 2) The role that space, both physical (in face-to-face interactions) and virtual (through a web-based platform designed for this purpose) can have in enabling the co-creation of new energy-related meanings. Through this exploration, this research aims to contribute to a paradigm shift within the field of energy consumption, which focuses not only on reducing energy consumption but also on reducing energy needs. What does CODALoop stand for? CODALoop stands for COmmunities who discuss, share and co-create energy-related DAta/information. In the CODALoop platform, these discussions, sharing and co-creation processes take place in Loops. Loops between individuals and their community and between communities and the policy level. Though these Loops new meanings of energy are expected to emerge and inform innovative energy policy approaches. In the coming three years, researchers will facilitate, observe and contribute with extra input to these Loops. As we speak, CODALoop community platforms are growing in local neighborhoods in Amsterdam (The Netherlands), Graz and Leibnitz (Austria) and Istanbul (Turkey). CODALoopAmsterdam is active in two neighborhoods, the Indische Buurt in Amsterdam East and Buiksloterham in Amsterdam Noord. These two neighborhoods have been selected as case studies because they host two different types of communities, in the case of Buiksloterham, a non-consolidated community, both physically (the whole area is currently being built) and socially (new relationships are also developing). This offers an interesting contrast with the Indische Buurt, which represents a consolidated community, both physically (the urban fabric has not changed drastically in the last century) and socially (even though new networks and relationships are constantly being built, this neighborhood has a stable history of belonging and community). Another important selection criterion is the type of social interactions currently happening in these two areas. In both neighborhoods two digital platforms, Buiksloterham.nl (http://buiksloterham.nl) and the Indische BuurtBalie (http://indischebuurtbalie.nl) have been developed in the last years. Buiksloterham.nl is run by a cooperative of local residents, entrepreneurs and other stakeholders interested in or working towards the realization of the Circular vision for Buiksloterham. IndischeBuurtBalie.nl is a joint venture of the local municipality, a local community center and several housing corporations, whose aim is to advertise the activities and initiatives happening in the neighborhood. The common goal of both platforms is to facilitate the creation of local networks and contribute to the process of community building. Besides, in both neighborhoods, social interactions take place as well in physical spaces, such as squares, streets, community centers, etc. Specially the Indische Buurt is characterized by its ‘bottom-up’ energy and its multiple citizens’ initiatives. The differences and similarities regarding the spatial character of current social interactions in both areas are analyzed and taken into account when suggesting research interventions. The Indische Buurt, “the Indies Neighborhood”, is located in the Eastern part of Amsterdam. It was named after the former Dutch East Indian colonies, since it was built in the early 1900s. The Indische Buurt was built to provide housing for (native) Dutch blue-collar workers. This growing working class was the consequence of the rapid expansion of manufacturing and transportation industries due to the opening of the new harbors and canals. Amsterdam and the Indische Buurt experienced a blooming period until the 1960s and 1970s when manufacturing began to decline. The housing stock, quickly built to house the large working class, went through a process of disinvestment and deterioration which accelerated processes of suburbanization. Many of the original native Dutch citizens moved to the suburbs, “going up (the social ladder) meant moving out (of the inner city)” (Anderiesen & Reijndorp 1990). As a result, the empty apartments became the new home of unskilled immigrants, known as ‘guest workers’, coming especially from Turkey and Morocco, who had come to the Netherlands to work in factories. The process of urban renewal which followed defended a controversial philosophy known as ‘building for the neighborhood’ (Anderiesen & Reijndorp 1990). The aim of the renewal programs was to renovate or replace run-down tenements preserving the working-class character of the neighborhood (Pennen & Wuertz 1985). As a consequence of that urban policy, the Indische Buurt still has a high concentration of low-cost housing which it is nowadays considered problematic. The current urban policies, both at the national and local level, favor a social mixing approach that aims at improving poorer neighborhoods’ conditions by increasing social diversity and attracting the (creative) middle class. In the Indische Buurt, the role that the housing associations and the local government have played and continue playing in this transition into a mixed-income neighborhood is crucial. After the privatization of the housing associations in the 1990s, rents have been raised to market levels and the social housing stock has been renovated and part of it has been put up for sale in order to encourage homeownership. In 2007, the Indische Buurt was included in the list ‘De 40 Vogelaarwijken’ which included the 40 most problematic neighborhoods in The Netherlands, in terms of safety and social cohesion problems (Gemeente Amsterdam Dienst Onderzoek en Statistiek, 2007). In order to improve this status, the local government received generous subsidies to ‘work’ on the neighborhood. Since then, among other actions, the local government has invested in the beautification of the public space, greening the neighborhood and creating attractive squares and streets. Also the local government has influenced urban planning policies to allow for certain types of shops, restaurants and cafes that appeal to the middle class (restricting other ‘ethnic shops’, such as call centers, for example) accelerating gentrification processes. As Hagemans et al. (2015) state, this transformation can be observed in streets such as the Javastraat, one of the main arteries of the Indische Buurt. Part of these subsidies (‘vogelaargeld’, in Dutch), allocated to ‘conflictive’ neighborhoods were used to support citizens’ initiatives and to encourage civil society participation. By empowering people and allowing them to take responsibility in the co-creation of their own neighborhood, citizens build new networks and relationships which contribute to improve the social cohesion of the neighborhood in the middle- and long-term. The aforementioned retreat of the state and the outbreak of the economic crisis in 2008 facilitated this process of citizen empowerment, making, currently, the Indische Buurt one of the most well-known neighborhoods in Amsterdam for its vibrant bottom-up energy. Buiksloterham is a 100 Ha former industrial area in Amsterdam North. The site used to be home to an airplane factory, a Shell oil laboratory, a large shipbuilding industry and other manufacturing businesses. Over time, most of the companies closed their doors or moved to other locations, leaving behind a waterfront brownfield with many areas where the soil is still polluted. 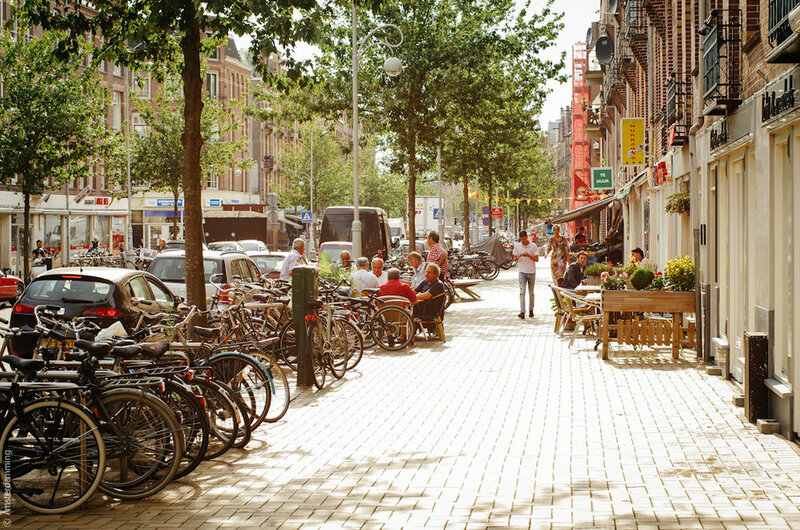 The city of Amsterdam, instead of buying out the remaining businesses and giving the site to a big developer, decided, approximately ten years ago, to experiment with a more incremental planning approach. This organic, bottom-up approach fits perfectly during the outbreak of the financial crisis back in 2008 and the following recession years. The zoning was changed to allow for a mix of uses and since then a diverse mix of stakeholders, with designers, architects and other creative entrepreneurs in the lead, started to populate the area. What characterizes these stakeholders is their common vision for Buiksloterham, based on circular principles (a good example of this experimental approach is the creative incubator De Ceuvel - http://deceuvel.nl/en/). Also, housing development has been encouraged in the area. In 2011, the municipality sold some housing lots, in areas which were not polluted, to people interested in building their own home, the so-called self-builders. This is how a community started to grow in Buiksloterham. The new residents set up a foundation called ‘City Lab Buiksloterham’ and created a digital platform to connect the people living in the area with the goal of sharing knowledge about how to build your own home or sharing construction tools, among other things. An important moment for the development of Buiksloterham took place in March 2015. More than twenty stakeholders, including local entrepreneurs, residents, the City of Amsterdam, Amsterdam water agency, among others, came together to sign the manifesto ‘Circular Buiksloterham’, agreeing on the sustainable and circular principles according to which the area will be developed. In this vision, energy plays a crucial role. Buiksloterham’s goal is to become energy self-sufficient with a fully renewable energy supply by 2034 (Buiksloterham.nl website). The ultimate aim of this manifesto is to investigate ‘Buiksloterham’s potential to become a world-class living lab for Circular Cities’ (Metabolic website).